Just slightly more than two months ago, I've shared about the bogus gold buy back scheme (Suisse International) and mentioned that it would not be the last. 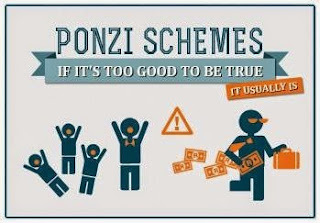 True enough, in less than 3 months, we had another potential $60 millions ponzi scam case as reported in today's The Sunday Times. Once again, this would not be the last. This time round, it is not involving any institution and seems to be an act of a greedy individual (her name is Ms Leong Lai Yee, as reported in the newspaper). She reportedly promises very high returns (up to 48% or so, wow!) through "investing" in distressed properties and managed to "CONvinced" around 60 people/friends to part with their hard earned money, which comes up to about $60 millions. She has gone missing and now and a number of the "investors" have lodged legal action against her. Learning Point #1 : If the promise seems too good to be true, most of the time, it is NOT true! Learning Point #2 : Most of the time, those get rich quick scheme is TRUE! But, the issue is they are the one get rich and NOT you! How to make room for LIFE? Check it out...HERE!